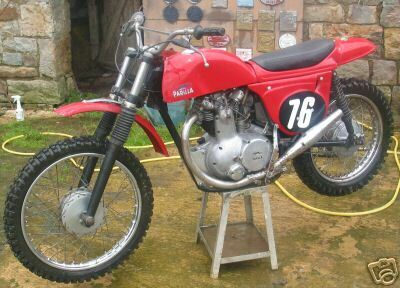 As I’ve researched the history of MotoParilla in the UK it came to light that for a short period in the ’60s efforts were made to race the Wildcat 250s by some of the big names in “Scrambling”. As a 10 year old I remember sitting in front of our 9″ B&W Bush TV on many a wintery Saturday afternoon watching the BBCs coverage of scrambling. These specially organised events must have introduced a generation of kids to the exciting world of off-road motorcycle racing & the heroes who tamed the snarling 4st 500s & lithe 250 2st bikes. 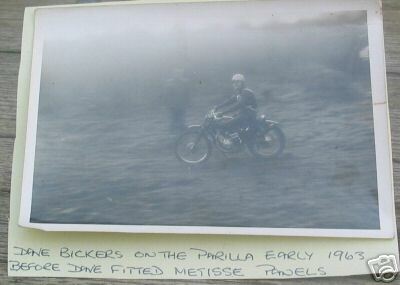 Names like Arthur Browning, Arthur Lampkin, Geoff Smith & the man whom I found out some 40 years later was involved with Moto Parilla – Dave Bickers. 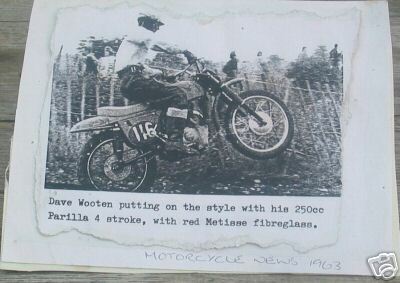 Other MX riders were also involved, Dave Wooten & Joe Johnson for sure & no doubt other “Southern Centre” experts threw a leg over a Wildcat in & around 1963. If anyone can throw light on the riders of the period or has any photos or articles showing the bikes I’d love to build up a record of the period. 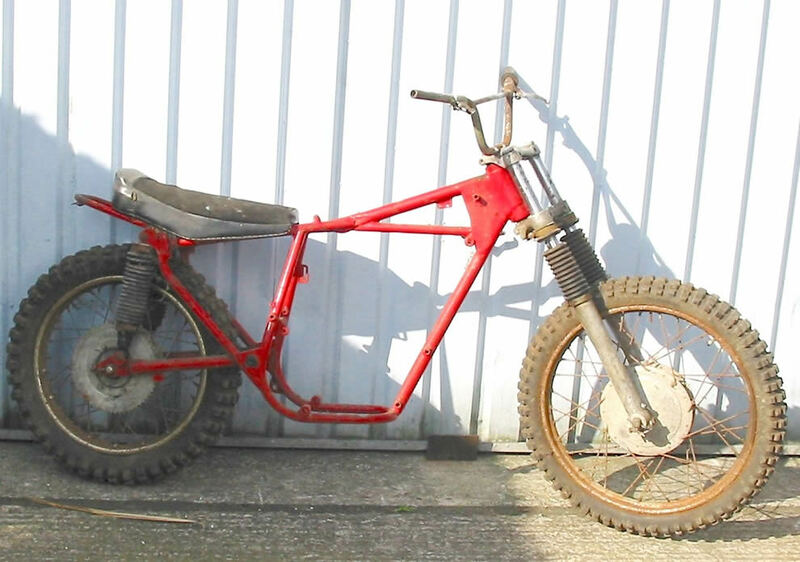 This bike appeared recently on eBay in France where the British owner relocated some time ago. The bike now resides in Germany. Note the long (front to back) engine plates needed when the frame geometry was changed. 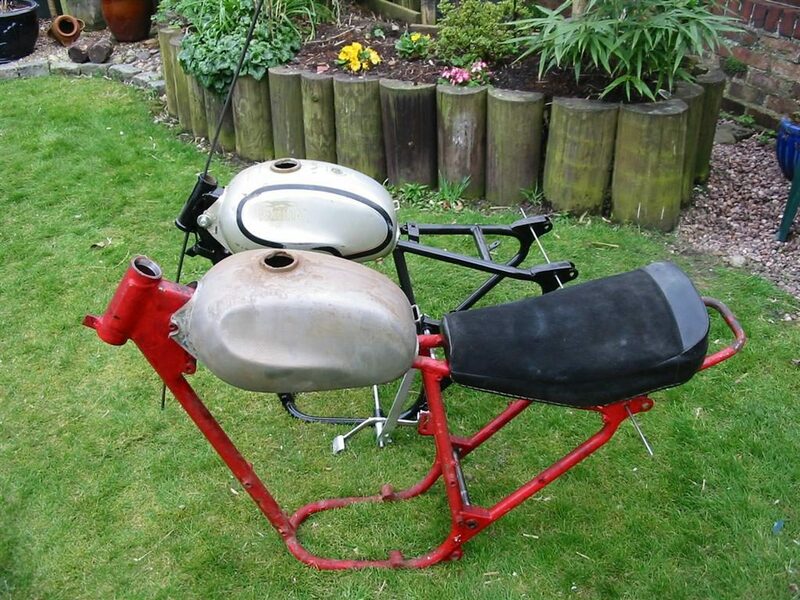 This is a rolling chassis which has recently been discovered. 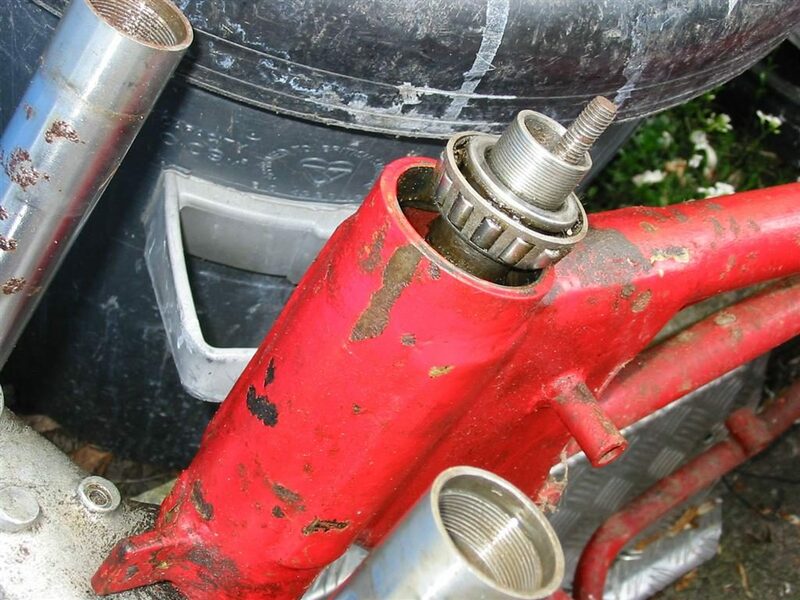 It came originally from the same importers stock as the Rickman & has had modifications made to the frame to take a far stronger, extended headstock utilising taper roller head bearings in place of the useless “cup & cone” originals. It uses the OE Ceriani MX forks with variable damping, Parilla hubs with 18″ rear & 21″ front rims. 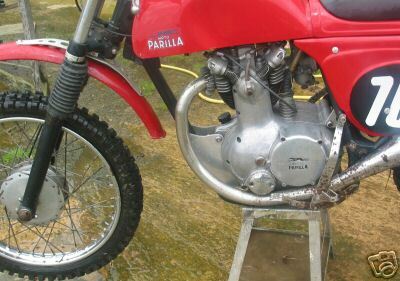 A complete 250 engine was also purchased from the same vendor. 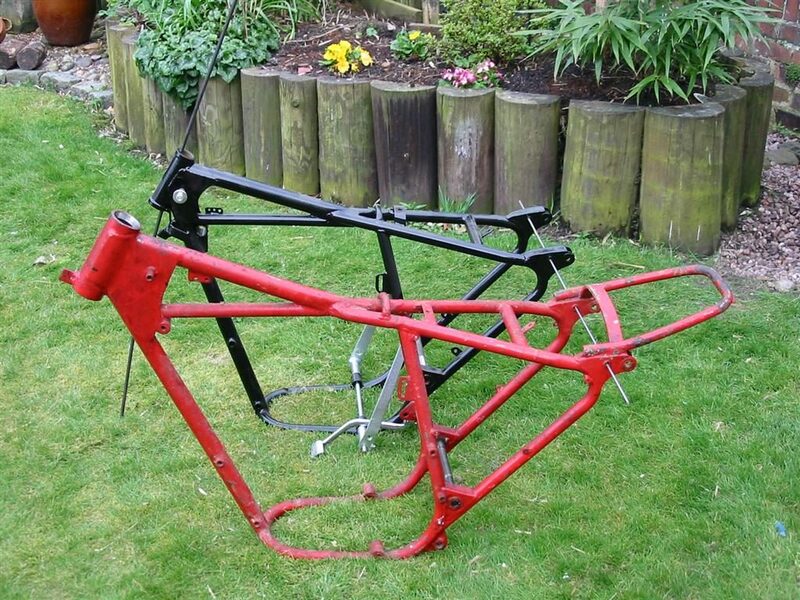 Note the comparison between a standard Wildcat frame & the modified version. Most obvious is the extended & reangled steering head, rear frame loop & strengthening across the suspension unit tops. There are less obvious mods to various brackets & the addition of small loops to retain mud deflecting canvas or rubber covers around the rear subframe area. I hope to return the bike to something like its original race condition. After thinking about redoing some of the quite crudely finished modifications to the frame I decided to keep all the original mods but take some time to finish them as they no doubt would have been if the Wildcat had proved to be raceworthy. The front lock stop was rounded off smoothly & the added rear chain guide bracket given a slot to carry such a device. By happy coincidence I had bought a box of odd shaped bracketry from the bikes vendor, some I recognised, others I had no idea of the use they could be put to. Now I know the “J” shaped strips were undoubtedly intended to be used on this bike as chain guides. Whilst inspecting the frame closely for cracks or other damage I noticed that under the thin red paint was another thick layer of paint. I carefully scraped back the red layer under the petrol tank & then in several places around the bike. 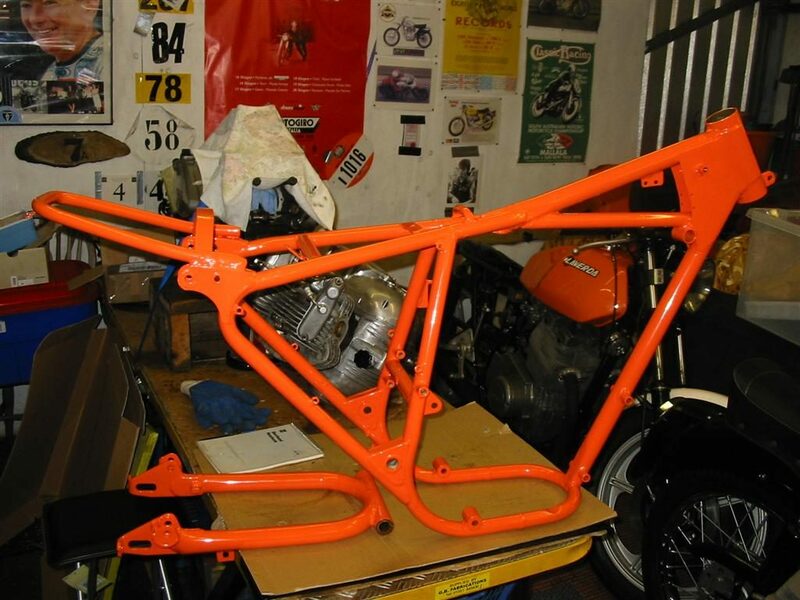 There was no doubt about it; the bike – after its frame modifications – had been painted orange! Now thats bright! Having finished cleaning & preparing/repairing the frame I decided to go with the evidence of its first post-modification paint job & have it refinished in bright orange. It will certainly be noticed when finished! I’m hoping the combination of orange frame & silver tank will jog some memories & maybe even fill in some of its currently unknown history. 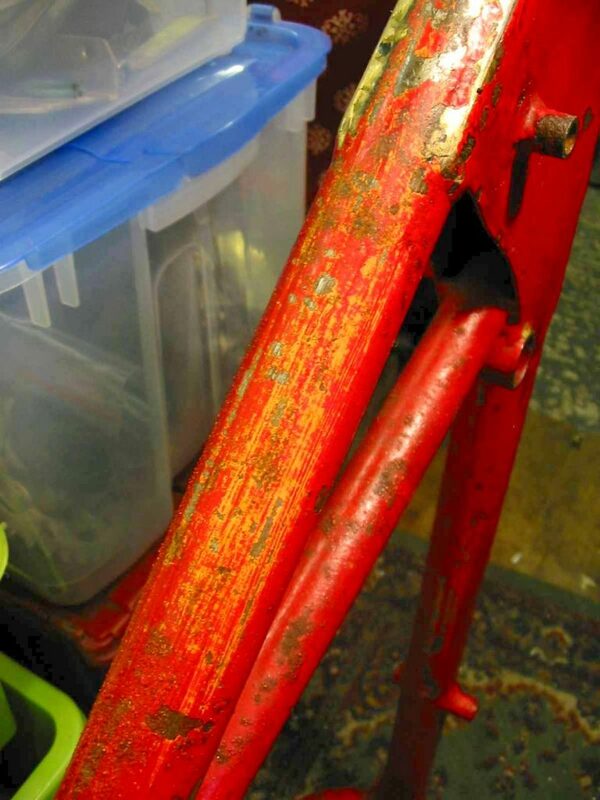 The next part of the restoration will be to find some period alloy mudguards. I have no evidence yet that they were fitted but in the early ’60s most scramblers used them & I’d be surprised if the OE steel versions were employed. I have a lightweight (but still huge) alloy seat base which will be recovered in vinyl to match the then almost universally used “leathercloth” material which was waterproof but still offered some grip when wet. In another happy coincidence, I had bought a modified Wildcat tank from the vendor on a previous visit. This had a good, undented, main tank body but the front mounts had been modified to take a bolt fixing rather than the slip-onto-a-rubber-sleeve OE mount. I had visions of using the tank on my Wildcat with the mounts returned to standard. I tried the modified tank on the modified frame & it slid into place perfectly Tank & frame reunited after 40+ years – what a stroke of luck!